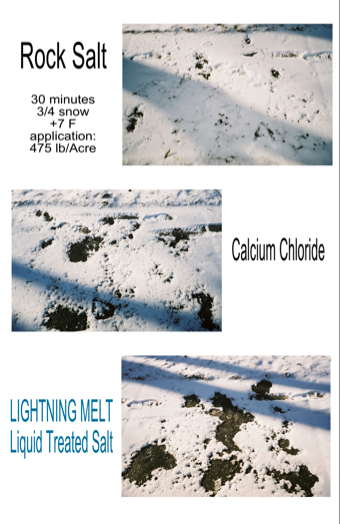 With Lightning Premium Ice Melter, operators have reduced their application rates 30% - 50% due to its optimal pre-treatment and great residual aspect. Lightning is superior in regards to reducing corrosion rates, working to colder temperatures, preventing refreezing and quick burn capability. Lowest operating temperature liquid on the market. Once spread, the first step for ice melt to work is allowing the salt to create a salt brine. The liquid blend attached to Lightning Melt’s salt crystal allows for immediate melting power when the salt crystals hit the ground. This difference in melting time is extremely critical in helping create a clean and clear black top, instead of quickly becoming a sheet of ice.